Are you ready for a joyride? Hero MotoCorp is committed to providing you with a joyful riding experience through Value for Money initiatives. In pursuit of this objective, we already incorporate a 5 Year Warranty, 5 Free Services, the Hero GoodLife Programme, and One-Stop Insurance solutions, all of which are available through a vast array of networks; more than 6000 service outlets Pan-India. To make your journey even more enjoyable, we have launched yet another first-of-its-kind service – The Hero Joyride Program. 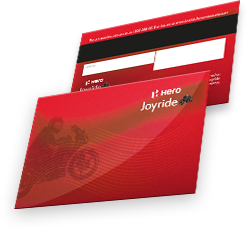 Joyride is a Pan-India Smart Card based Annual Maintenance Package for all Hero vehicles that is offered by Hero Authorised Service Centres. The programme will enable you to meet your vehicle’s servicing needs with ease. As a member of this annual maintenance package, you will enjoy a host of benefits and savings when getting your two-wheeler serviced. Proper maintenance will surely boost the performance of your two-wheeler. For more details, visit your nearest Hero Dealer.